The conspiracy of the evil wizard Lord Voldemort is closing in on Harry and his compatriots and the chosen one has to go on the run. With Dumbledore murdered, the security of Hogwarts is left behind with several Horcruxes to be found and destroyed (items containing parts of Voldemort's soul). So Harry, Hermione and Ron are on their own to try and fulfill this mammoth task with very few leads and Voldemort's cohorts and Death Eaters on their heels. With a bit of a Lord Of The Rings mood underlying a section of this first part of Harry Potter's epilogue (having their triangular relationship tested), unless you're an avid fan, this quest to find the Horcruxes and a weapon with which to destroy them can get a bit laborious as it stretches close to two and a half hours. Along their trail of close calls and clue gathering (which is very much a video game staple and can easily be translated to that platform), they find out about The Deathly Hallows, the three most powerful items existing in the wizard realm. The action sequences (and some more adult images than normal) are interspersed with elongated scenes that only those invested in these characters will tolerate – but luckily for the producers, there are millions of them! 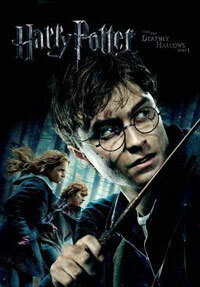 An extra disc of bonus features include several production highlights like a look at a fight sequence in the café, Hagrid's flying side-car, a dissection of the complex scene featuring seven Harrys, the creation of the digital Dobby and Kreacher characters, Alexadre Desplat's soundtrack, a day on the golfing green with Rupert, James and the twins, a trip to the Harry Potter Universal theme park, plus about half a dozen deleted scenes.